Shares of nutritional supplement seller Herbalife, the company that hedge fund manager Bill Ackman is shorting, tanked in after-hours trading during a CNBC report. 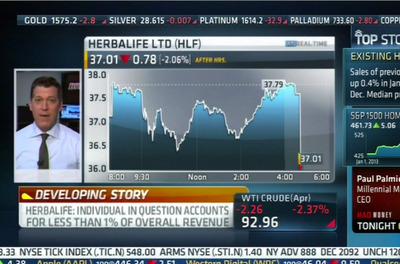 CNBC’s Scott Wapner reported that one of Herbalife’s 50 “Chairman’s Club” members, may cut ties to the company. The “Chairman’s Club” is reserved for the company’s biggest distributors. According to Wapner, the unnamed distributor had a relationship with a delisted vendor that was used to generate business leads. 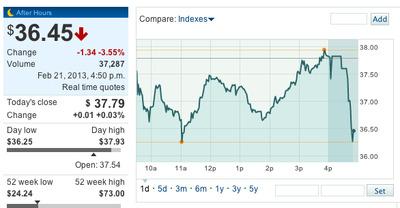 Herbalife stock fell immediately on the news. Wapner then added that Herbalife downplayed this news saying this distributor accounts for less than 1% of overall revenue. The stock was last off more than 3.5% in after-hours trading.